The Ring Road is 1,332 km route that was created in 1974 and connects major towns across the country, such as Reykjavik, Akureyri and Höfn. Taking the Ring Road is a great way to travel to different parts of Iceland, and to visit popular sights. So if you start your traveling adventure from Reykjavik, you will be able to enjoy the Golden Circle. This route consists of the most remarkable sights in South Iceland, such as National park Þingvellir, the ancient open air Parliament, that became a World Heritage Site in 2004. Also you will be able to see Gullfoss, one of the most beautiful waterfalls in the country, it is also known as “Golden Falls”, as the water looks gold in sunny days. And of course Haukadalur valley, which is famous for its geysers, and one of them is still active an erupts every 10-15 minutes! Fortunately apart from the Golden Circle, there are number of places that you will be able to visit in South Iceland, such as Eyjafjallajokull Glacier, which became well known worldwide, after its latest eruption in 2010 caused chaos among commercial flights in Northern Europe. Also Jökulsárlón Glacier Lagoon is really popular among tourists, it has such an outstanding landscape, that it was featured in several Hollywood films. Vatnajökull National Park is an ideal place for hiking and discovering stunning Icelandic flora and fauna. Going further to the East, you will be impressed by striking views of East Iceland. Hallormsstaður is the biggest forest in the country, it will give you a great opportunity for hiking and you will be able to camp near beautiful Lagarfljot lake. Skrudur Island is a unique green island, that used to be a place, where fishermen stayed on the way to the South. Gorgeous waterfall Hengifoss and and picturesque mountain Dyrfjöll are also worth seeing. On the way up North, you will have a chance to see probably the most striking landscapes, even for Icelandic standards! Detifoss is the most powerful waterfall in Europe and you can literally feel it, while standing next to it. Myvatn lake is another sight that you definitely should visit. The lake that was formed more than 2000 years ago due to the lava eruption has many fascinating volcanic features. Myvatn Nature Baths is a perfect place to bathe in geothermal water and is also known as northern answer to famous Blue Lagoon. Ancient Lofthwllir cave and sulphur hot springs in Hverir will leave you with unforgettable memories! Finally when you reach North Iceland, you will be able to discover beautiful waterfalls, such as Dettifoss and Godafoss, the latter one is also has a historical value, as according to the legend, when Iceland became Christian, statues of Norse gods were thrown into this waterfall. Another remarkable sight in northern part of the country is Askja: it is a stunning caldera with a lunar-like landscape. Also one of its craters Viti is a famous bathing spot. If you prefer hiking, Ásbyrgi canyon, which has a shape of a horseshoe, is a fantastic chance to enjoy untouched beauty of North Iceland. Visiting North Iceland, you should definitely travel to Akureyri. This city was formed in 9th century and is also known as the capital of North Iceland. Sulur mountain is a great place for hiking. Lystigarðurinn botanic garden will give you a chance to discover unique Nordic flora. Also if you go further North, you will see an ancient place Gasir, that used to be a trading market during Medieval time. Grimsey island, which is surrounded by Arctic Ocean, is home to thousands unique seabirds. 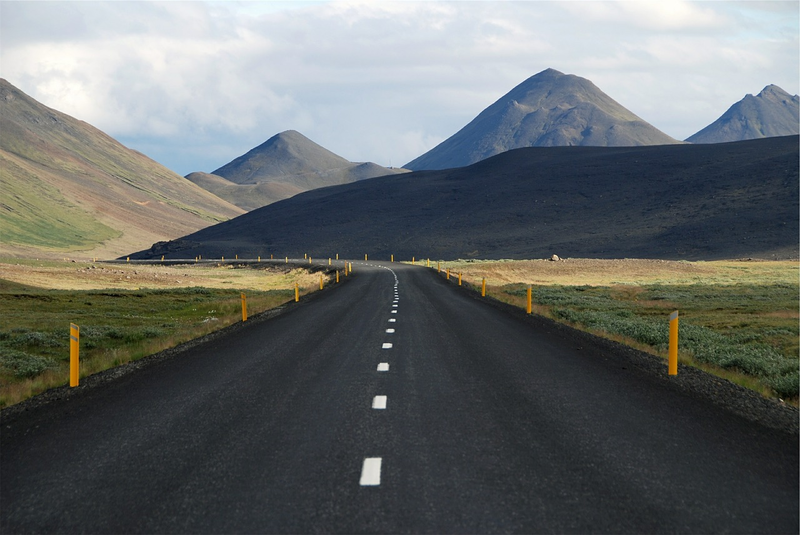 Driving towards Reykjavik, you will be able to see beautiful sights of West Iceland. Among the most famous places are dazzling waterfalls Hraunfossar and Barnafoss, huge natural hot spring Deildartunguhver and beautiful Hvalfjordur fjord. When you finally reach Reykjavik, you can either walk around the city, go shopping or enjoy geothermal pools. Depending on your time and interests, you can choose only few places on your Ring Road route, or you can try to visit as many sights as possible. One thing is for sure, this trip will leave you with great memories and loads of beautiful photos!